Be honest… at any time in the first half did you think, “I can’t believe they are going to start the season 0-2”? 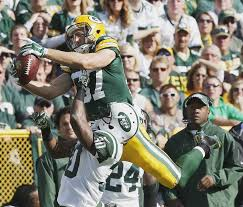 Things certainly didn’t look good for the Packers in the first quarter of their game against the New York Jets. Down 14-0 after just two possessions and then down 21-3 in the second quarter; fortunately, a couple of field goals and a TD before halftime gave the Packer faithful some hope. Here’s a look at two interesting stats from yesterday’s game. Packers surrender 14 points in the first quarter: Green Bay was down 14-3 at the end of the first quarter. It was the 44th time since 1966 (the start of the Super Bowl era) that the Packers have allowed 14 or more points in the opening quarter. Prior to yesterday’s game, the Pack was a miserable 9-33-1 in such games (a .221 winning percentage). Not much hope for a victory, was there? Yesterday’s win was the first win after giving up 14 points in a quarter since January 18, 2008 when the Packers gave up 14 points to the Seattle Seahawks in the first quarter of an NFC Divisional playoff game. The Pack went on to win that game 42-20. It was also the last time the Packers gave up 14 points to their opponents in the first quarter at home and still won the game. Of the 44 times that the Packers have allowed the opposition to score 14 or more points in the first quarter, 11 times it happened at home, 33 times it has happened on the road. The Packers are now 5-6 in those games at home; 5-27-1 when it happens in an away game. * December 8, 2013 vs. Atlanta: Packers gave up 21 points to the Falcons in the first half; they won the game 22-21. * September 12, 1982 vs. L.A. Rams: Packers gave up 23 points to the Rams in the first half; they won the game 35-23. * November 1, 1981 vs. Seattle: Packers gave up 21 points to the Seahawks in the first half; they won the game 34-24. In the 18 games where the Pack allowed 21 or more points in the first half and three or less in the second half, seven were played at Green Bay with the Packers winning four of those games. Eleven of those games were played on the road; the Packers are 0-11 in those games.